During a lunch break I took my friend Leigh aside to ask her some questions about her dance career so far. 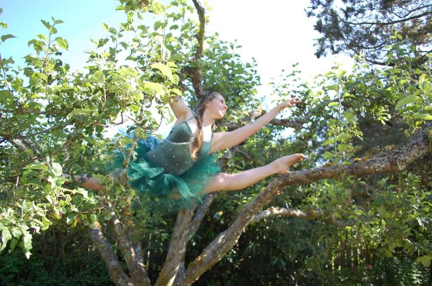 Unlike many SFU undergraduate dance majors, Leigh did not enter the program right out of high school. It wasn’t until after years of teaching and dancing in Victoria that she decided it was time for a change. I couldn’t wait to hear what her thoughts were on the journey so far. Madeline: So Leigh, when did you move to Vancouver? Madeline: Why did you want to come to Vancouver? Leigh: Because Victoria has very little in the way of arts jobs. There’s no growth going on there, there’s no outside influence, artists hardly visit there. There’s really no work other than studio teaching and small contract style performance opportunities. Madeline: You were studio teaching at Dansko studio. How many years did you teach there? Leigh: I did some assistant teaching and then taught for 7 years there until 2011. Madeline: What styles did you teach? Leigh: Yes, ballet boot camp. Madeline: What was your favourite age group? Leigh: I liked the teenagers they scared me at first but you get to know them. Probably the 8-10 year olds, they’re there, they work hard and they’re interested in learning. The younger ones are fun but a little more chaotic. The hardest age group would be the 12-14 year olds. Larissa (a mutual friend) points out: You are Henry Daniel‘s teen jazz. Madeline: So you have become the student that you hate the most. Leigh: The teacher has become the student. They are just developing their fresh attitude. I really am describing myself. Madeline: That’s a good question. You are a student at SFU. What’s it like being a teacher so long becoming a student again? Leigh: Its’ weird. I was still always taking classes but it would always be peers teaching them. SFU is so different than what I was training in before. Madeline: Were you doing a more commercialized style? Or maybe a more technical style? Madeline: As you would for a jazz. What are the parts that you like about being a student at SFU? Leigh: I like being in dance. I do have to remind myself every day that I’m lucky to be here and doing this and not doing many another thing I could be doing or have done in the past. Like university programs that I have tried to convince myself into like I could be an accountant, I could work in an office, I could do this” No, just do what you love and you’ll figure it out after. It’s just a step, all training is training. At some point, everything we do here at SFU I’m sure will feed back in. The different classes will at least expose us to what we do and don’t want to do in dance. Studios get bashed a lot here at SFU but they are very good at putting students at an appropriate technical group. We put students with similar technical levels together so we can push them as a group. Here at SFU though they accept a wide variety of student and cater the class to a lower level. That’s where I think the studio system excels. Madeline: You would think that since we are in the “big city Vancouver” that we would be able to provide classes tailored to everyone’s particular level. Madeline: Well, what made you decide SFU? Leigh: A couple of reasons, I auditioned at Calgary, the audition was good, but the classes I saw and talking to students, I wasn’t into it. I couldn’t go to York for the audition and it was hard to tell what it would be like. I did make some connections through email. They do a lot more academics, they have a lot more options but if you actually want to be dancing they don’t have lot of that. I had heard good things about SFU from people who attended. My friend who went years ago had the same feelings that I have now, didn’t enjoy all the classes, by third year you are tired of doing the same moves, same warm-ups but it’s all training. When you have finished you have a degree in dance and you can do what you want with it; take as little or as much as you want. Or forgot about it and go pursue your commercial career in dance. Once she graduated, my friends’ first job after SFU was a Can-Can dancer and then a Vegas show girl. She still later in life taught modern classes and used the Graham techniques and the Cunningham concepts but did not become one of those dancers. And also, honestly, I love jazz dance but unless you are pursuing musical theatre, there’s no such thing as a degree in jazz dance. Leigh Machnee. Leigh being her best, shared in 2015. Courtesy of Leigh Machnee. Madeline: Also, there aren’t as many opportunities for work in Vancouver if you are doing jazz. It’s hard to get a grant from the government to support your jazz dance. Leigh: Yeah, like my high kicks are going to make a difference to society. Leigh: Right? And I don’t think training in a way that is maybe not your favourite is going to make you worse at what you really do love. In Vancouver you still have the option to go to Harbour Dance Centre and doing a jazz class or a hip-hop class, doing something that’s fun and relaxed, and reminding yourself how much you do enjoy other styles. In Victoria there’s no opportunity to do that. Madeline: What about some of your professional performance experience in Victoria? The pantomime theatre? Leigh: if anything to go back there one day and maybe be able to be that person who makes more performance opportunities for up and coming artists. It’s sad, the capital city of the province, it’s a great city, it’s not big enough. Vancouver has more options.